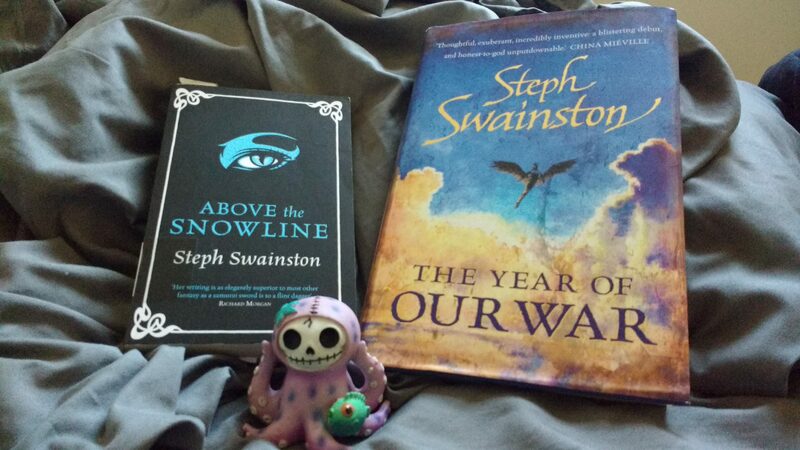 I first read Steph Swainston’s Fourlands series when I was getting interested in the “New Weird” movement several years ago, and Above the Snowline was for whatever reason the only book of it my library system had. I thought it was alright, and pirated an ebook version of The Year of Our War on a whim, during which I fell immediately in love and ordered hard copies of the entire series through legal means as penance. I can’t say enough about how convention-breaking the series is. I’ve been re-reading it since the announcement of a new book after a five year hiatus, and I’m appreciating Snowline much more the second time. Jant is the sole narrator of the first three books, but Above the Snowline uses multiple first-person POVs. This gives us a few different angles from which to view Jant, who in aggregate does seem to be exactly the sort of person you take him for while reading the other books. It also makes for an interesting presentation of Dellin, one of the the vaguely-stone-age feline humanoids who sets the book’s events into motion. There’s ample humor spun from initial cultural differences — just wait for the bit where Jant stops in at a brothel — but Dellin is quickly shown to be neither a naif nor a noble savage caricature. She doesn’t assimilate into Awian culture. Jant doesn’t “go native” for her and lead a glorious revolution. I thought it was wonderful to see a female character with agency, motivation, and goals that were clear even if a narrator at any given time may be a bit oblivious to them. And goals that don’t entail courting the protagonist, at that! The main plot moves along fairly steadily, punctuated by the occasional action sequence, one of which is genuinely nightmarish in its tension. The shifting narrators give a broad view of the political circumstances which doesn’t fall victim to the modern “all sides are kind of a little bad so truth is in the middle” school of argument. It’s true that nobody comes out of it untarnished, but the book definitely has its sympathies. Above the Snowline, like the rest of the Fourlands series, has thoroughly-drawn characters doing things a jaded genre reader wouldn’t predict just from reading the back cover. If you can appreciate an author who really knows how not to meet your expectations (and consider that to be a positive trait,) you should absolutely binge-read this series in advance of Fair Rebel coming out later this year.